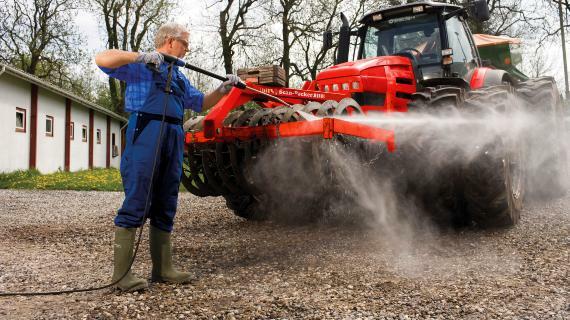 Nilfisk offers both stationary systems for farm buildings and mobile units for outdoor spaces. Increasing consolidation within agriculture is driving demand for automation and advanced equipment. At Nilfisk, we offer both tailored stationary systems for your farm buildings and storage facilities as well as mobile units for machinery, outdoor spaces, courtyards, machine pools or production. Regular cleaning protects your animals from pests and sickness, and hygiene requirements are becoming more and more strict, which can take time away from your primary business. Nilfisk can help. From pressure washers to vacuum systems and floor care equipment, be it mobile or stationary we offer products that help you meet your everyday cleaning requirements. Our machines are powerful enough to ensure clean stables, stalls, vehicles and equipment. Whether your business is livestock farming or dairy farming, Nilfisk cleaning equipment is designed to make your facilities more sanitary and your cleaning practices more productive. Our environmentally-sound cleaning solutions improve cleanliness with fewer chemicals and less labor and significantly improve staff wellbeing. Improving your facilities and enhancing your reputation is all part of our commitment to providing you with superior value, reliability and efficiency in everything we make and everything we do.